Deer Park Villa boasts of a comfortable and quiet stay. Deer Park Villa has total of 6 bedrooms with attached bathrooms ( ensuite washrooms ). 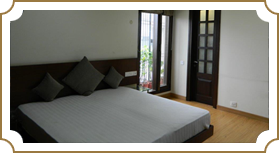 The rooms can be hired as independent single/ double rooms or as 2/3 BHK full service apartment. The floors are accessible through the elevator in the building. The guests have an access to the beautiful terrace. © 2015 Deer Park Villa. All rights reserved.